"His head was upside down when we got him," Tompkins told The Dodo. "Lead affects the nerves, so that's your brain, your use of muscles, all parts of the body. The birds often cannot stand ... They usually have difficulty breathing. They cannot even open their beaks." 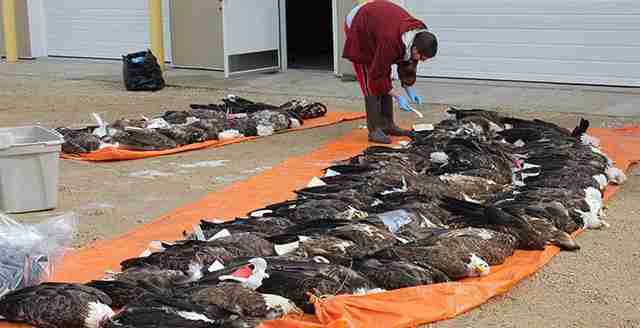 The lead gets into the bodies of bald eagles - as well as owls and other kinds of raptors - after they've eaten dead animals shot by hunters who use lead bullets. "Raptors are quite willing to be scavengers, so they scavenge," she said. "They eat things that have been shot. Lead ammunition is the biggest source." Birds with more severe poisoning who manage to survive take months to treat and fully rehabilitate. "We had one eagle whose lead level was relatively low, but she was paralyzed, she couldn't stand, she couldn't unclench her feet," Tomkins said. "It took several treatments to get the lead level down. It took several months for her to fly normally again. It took six months. That was a long time." Even when bald eagles suffer from lower levels of lead exposure, their coordination and decision-making can be compromised. "This can put him in more dangerous positions, like scavenging along the road for roadkill and then he can be hit by a car," Tompkins explained. 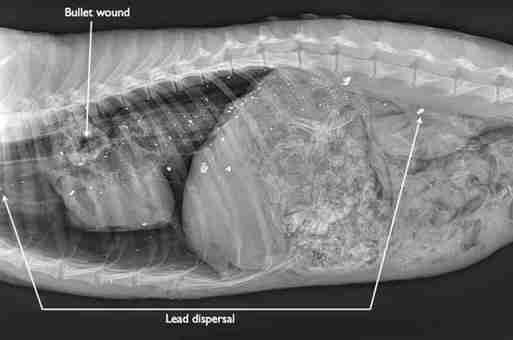 As Tompkins' latest patient was struggling for his life, the U.S. Secretary of the Interior, Ryan Zinke, was overturning a ban on the use of lead ammunition in wildlife refuges. 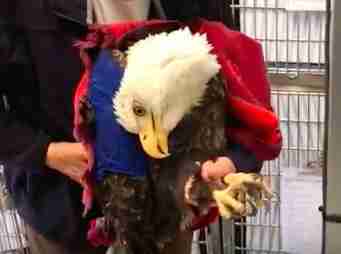 The ban aimed to help save animals, including the iconic American bald eagle, from dying slow deaths from lead. Zinke argued that the interests of hunters were not sufficiently represented in the ban. 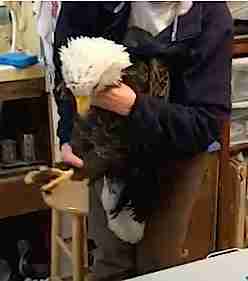 Sadly, the latest bald eagle who came into the center never had a chance to fly freely again. After four days of treatments to clean the lead out of his bloodstream, the bird's body finally succumbed to the poison that had already reached his tissue. "This particular bird, every once in a while, he'd get startled and flap his wing out of fear, and then he'd stop," Tompkins remembered. "The treatment cannot reach the lead that's already gotten into other tissues." Because lead poisoning is so prevalent, it's hard to even tally how many bald eagles and other raptors are impacted by it each year. Last year, Tompkins tested 160 birds, almost all raptors, for traces of lead. "We're finding it in more and more species," she said. "We started off with eagles but now we're also testing hawks, owls and other birds." Tompkins found that 80 percent of eagles, 30 percent of hawks and 25 percent of great horned owls had lead in their blood. 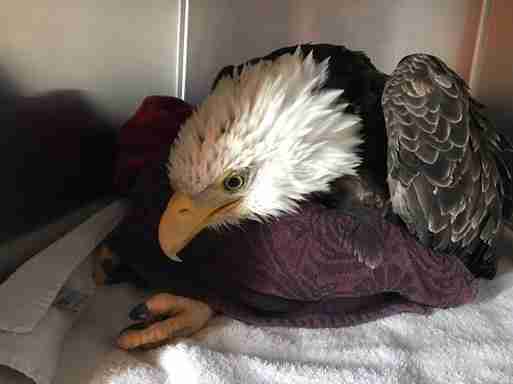 "So far this year we've had three bald eagles come into the center - all of them had toxic levels of lead," Tompkins said. "Lead is toxic. There's no argument about that." 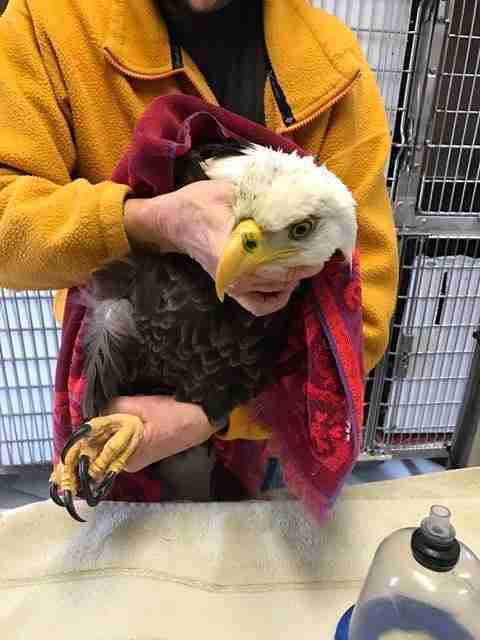 To give bald eagles impacted by lead a chance to survive, you can contribute to the rescue center.